I have managed to become the victim of Tesco Clubcard points theft for the second time. This is not a great track record, to be honest. It is partly my fault as I was not fully on the ball when I first spotted something strange happening. Let me explain …. I use a points tracking service called AwardWallet. If you have a lot of loyalty accounts it is a very useful bit of software – especially as the core product is free. It operates as a desktop programme and as a smartphone app so you can choose how to use it. AwardWallet updates all of your points balances in a single click. It goes off, opens your account, reads your balance and logs you out again. I ran the app on Saturday morning when, annoyingly, I was out of the country. It notified me that my total of unused vouchers had dropped by £50. This seemed a little odd but I was not in a position to check as you cannot access the account part of the Clubcard website from abroad. I then forgot all about it …. On Monday morning, back in London, I ran AwardWallet again. This showed yet another £50 drop in my total of unused vouchers. Logging in to the Clubcard website, it turned out that both has been used at a Tesco store about 1.5 miles from where I live, but one which I had never visited. It then struck me that I had never received my May 2015 Clubcard vouchers. I didn’t notice at the time because, as I never redeem them immediately and just put them in a drawer, their arrival never makes much impact. Clearly someone had got their hands on them. The Tesco call centre was excellent – this is clearly a common problem. 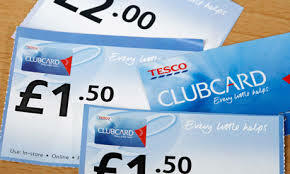 All of my outstanding Clubcard vouchers – even older ones – were cancelled and recredited to my account. As a bonus, this reset the 2-year clock on their expiry. Even though the vouchers were spent close to my house, Tesco was not at all suspicious of my motives for reporting them stolen. If you have multiple loyalty accounts, do take a look at AwardWallet – it is an excellent service. PS. You’ll be pleased to hear that whoever stole my vouchers had learnt something. Whilst the first £50 voucher was used for £50 of shopping, the second voucher was used for a Clubcard Boost deal and used to purchase £100 of items!